The York Revolution announced the signing of World Series champion and no-hitter artist Jonathan Sanchez on Saturday morning, in advance of the team’s day-night doubleheader against the Somerset Patriots. The left-handed Sanchez made his Revs debut in game one of the twinbill. Sanchez brings another veteran presence to the Revs staff. The 35-year-old has been pitching in his native Puerto Rico, and owns 39 wins and a 4.70 ERA in eight Major League seasons, having appeared in 194 big league games (137 starts) with the San Francisco Giants, Kansas City Royals, Colorado Rockies, and Pittsburgh Pirates. Sanchez was selected by the Giants in the 27th round of the 2004 draft out of Ohio Dominican University where he authored four no-hitters. After a quick climb through the Giants system, Sanchez made his Major League debut in 2006 out of the Giants bullpen, and retired all three Rockies (Todd Helton, Matt Holliday, Garrett Atkins) in his first inning of work. That performance was overshadowed by Barry Bonds’ 715th home run as he surpassed Babe Ruth for second all-time on the same night as Sanchez’ debut. Sanchez went 2-0 with a 1.37 ERA in 22 outings in his first big league stint before being sent back to Triple-A to work on his craft in a starting role. He returned to the Majors that September, winning his first start against the Reds. Sanchez entered 2007 as the Giants’ No. 2 prospect behind only Tim Lincecum, making the Opening Day roster and appearing in 33 games (four starts). Sanchez again made the Opening Day roster in 2008, this time as the No. 5 starter. He struck out 10 Padres in his second start, did so again vs. the Reds in late April, and won four consecutive starts at one point. The 2009 season presented a rough beginning with a 2-8 start, and a move back into the bullpen. Sanchez was called upon to return to the rotation on July 10 when Hall-of-Famer Randy Johnson was sidelined with a shoulder strain. All he did was throw the first no-hitter in AT&T Park history, doing so against the Padres with his father Sigfredo in attendance, watching his son make a big league start for the first time. He struck out 11 and took a perfect game into the 8th with the only base runner coming on an error. Aaron Rowand made a spectacular grab on a drive in deep center to preserve the no-no in the 9th, as Sanchez completed the first no-hit game by a Giant since John Montefusco no-hit the Atlanta Braves in 1976. Sanchez ranked 4th in the N.L. with 9.75 strikeouts per nine innings during the 2009 season, trailing only Lincecum, Yovani Gallardo, and Javier Vazquez. 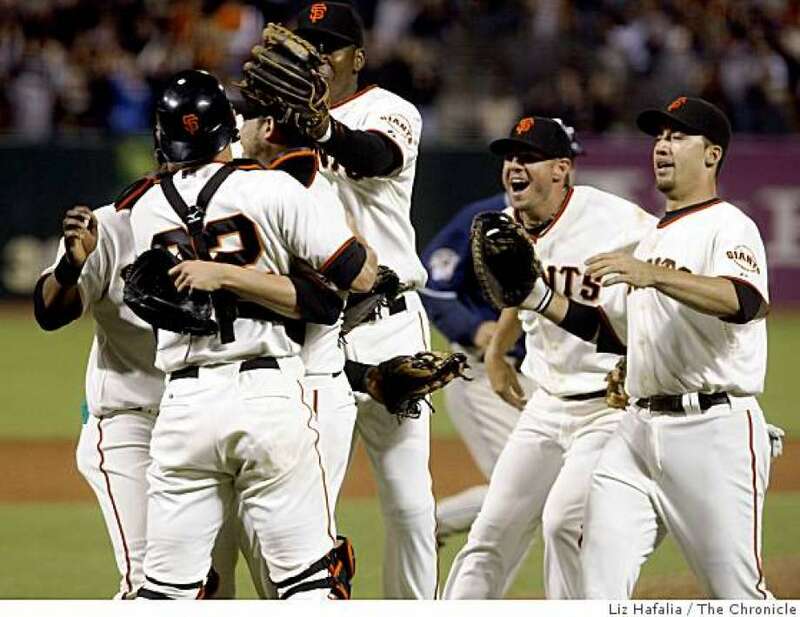 Sanchez’ best season came in 2010, going 13-9 with a 3.07 ERA and winning the Giants’ clincher as San Francisco clinched its first postseason berth since 2003. Sanchez struck out 11 Braves and allowed just one run on two hits in 7.1 innings in his first playoff start, eventually helping the Giants go all the way to win the World Series, their first since moving to San Francisco in 1958. Sanchez allowed the fewest hits per nine innings in the National League that season (6.6) and ranked 8th in strike outs (205). Sanchez battled injuries in 2011 and was traded to Kansas City that November for Melky Cabrera. He was shipped to Colorado shortly before the deadline in 2012 for Jeremy Guthrie. Sanchez last pitched in the United States at Triple-A in the Cubs system in 2014. He did sign minor league deals with Cincinnati for 2016 and Kansas City for 2017 and was assigned to Triple-A with a spring training invite in both cases, but was released. Sanchez has also competed internationally in the World Baseball Classic, doing so with Puerto Rico in 2009, firing four shutout innings in a win over the Netherlands and leaving in line for a victory against the United States. Sanchez was outstanding in his Revs debut, retiring his first nine batters including five strike outs. He struck out the side in his first inning, and allowed just an infield hit over four shutout innings in his debut start, combining on a 4-0 win vs. Somerset in Game 1 of York’s day-night doubleheader vs. Somerset on June 30 at PeoplesBank Park. This entry was posted on June 30, 2018 by blogtoblogchamps. It was filed under Player News, Team News .